Cassandra has survived the zombie apocalypse. She and others have banded together to search for more survivors. On one such rescue mission, the zombies get lucky and Cassandra is their victim. Instead of dying, Cassandra finds herself in her own past, days before the outbreak of the virus that turned all the adults to mindless monsters. She has one chance to stop it all. Well, maybe more than one. I stand ready, my guard up. I know the attack could come from either side, but will most likely come from behind. They love biting into the back of a neck, breaking it if possible, that way the kill stays fresh while they feed. Disgusting creatures. I'm not about to have my blood taint the snow. However, I face the building, watching for my best friend and partner to emerge. It's not bright, exposing my neck, but without guns, luring them in close is the only sure way to kill them. Not that they are terribly cautious, but some recognize a kid with a rifle or Glock. I have neither. I did, before . . .
Why didn't we bring more ammunition? I mean really, we knew what we were in for when we got outside the fence. Sometimes we really are just a bunch of stupid kids. I'm definitely finding reloads before we head back. This city is hardly stripped at all, but this recovery isn't for supplies, it's for people. The graffiti on the wall is fresh “We are inside.” Smart kids. The meat sacks don't have enough sense to read, and even if they do make out the words, they don't understand what they mean. Other kids, like Heph and I, we can read just fine. I shiver slightly, cold but the tension I'm holding in each hand, arm, and leg is keeping me warm. The icy wind ruffles my short spiky hair, and I add hats and scarves to the shopping list when we have the kids and can raid the town. What is taking Heph so long, anyway? Get the kids and get out. I whirl to meet my opponent, blade raised. The brainless meat sack is fast and ugly as sin, slathered in crap and dirt, but he’ll be much prettier without that head. His black-red blood stains the snow, not mine, and I turn for his friend, adding another kill to my tally. Heph will be pissed when I pass him again. I grin with satisfaction. Heph saved me, literally. I was a crying, scared, running wreck when he took me under his wing, taught me to fight, to shoot, to hot wire a car, break into a building. His total kills topped mine for a long time, but I've learned and I'm faster than he is. My score grew as my experience did and I've been slowly matching and overtaking him in death tolls. I was ahead before we left Freetown, but he got to count all the bodies he mowed down in the truck. Hardly fair. This mob should be enough to push me over again. My cockiness is my demise. I see something red in the distance as a monster bites into the side of my neck and I scream in pain and rage. My glasses are knocked from my head and I fall to my knees, everything going dark. I can't die, there are too many people counting on me, too much to do. I don't even know if Heph got the kids out. My legs are wet. Why are my legs wet? I smell salt, and feel a breeze. Are there breezes in hell? I suppose I could be in heaven, but I doubt they’d take me. I'm pretty sure I broke every rule there ever was in a bid to survive. Opening my eyes, I prepare for the worst. I wrote my first novel in university and didn't write anything else fiction until 2009 when I jumped into fanfiction. I still have that first novel, but I'm afraid to even open it. Photographs. 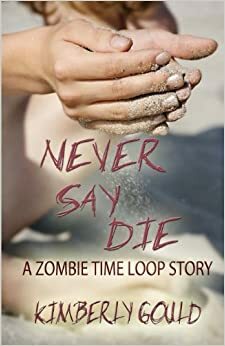 Two of my books, including Never Say Die, were stumble on while writing a photo prompted flash piece. There was so much story that went beyond those first thousand words that I had no trouble making it novel length. Hearing from people who like what I've written. I write for my own enjoyment, but there's a special bump I get when someone else gets a kick out of it. A zombie time loop. It's like Ground-hog Day (if you've ever heard of that movie). Our poor heroine has to relive the apocalypse over and over again until she can prevent it. The flash fiction piece that spawned this novel was written for the Picture Prompt Challenge which has evolved into Daily Picspiration (picspiration.blogspot.com). There is a new piece daily based on one or a pair of pictures submitted by the authors and dealt out by the admin. There is a lot of really fabulous stuff there. Kimberly Gould hates being called Kimmy, but her mother called her Kimmydonn and that was okay. She lives in Edmonton with her husband and daughter. When she isn't writing about the post-apocalyptic world, she is doing her best to prevent an apocalypse as an environmental consultant. She is the author of the Cargon series as well as Thickness of Blood and Never Say Die: A Zombie Time Loop Story. You can find her anywhere online as Kimmydonn, including her website, Kimmydonn.com. ones other color patterns throughout contemporary furniture offers released rise to a new style of furnishing. Bold AS WELL AS bright colors are generally used in making futuristic outlandish furniture designs. Classic black AS WELL AS professional-video-recording-services white colors tend to be meant to portray simple IN ADDITION TO sober touch. City life is actually signified through strong AND ALSO vivid colors. Aristocratic theme is usually portrayed by way of dark colors.